From a distance, and in the absence of a knowledge of the local languages, news about the “rojava revolution” in nothern syria remains fragmentary and often contradictory. While supportive of the movement, questions and doubts remain which we are unable to address. (These doubts may seem problematic, almost obscene, to some, for whom the urgency of the situation demands unconditional support; but no political movement, however seemingly close to anarchist “ideals”, can claim blind adherence). At best, we continue to try to follow events and share what we hope will further the understanding of the revolution. The attached video are the segments from the bookfair panel that most directly addressed the economic and decision making structures of revolutionary Rojava. The text that follows summarises what is said in the video but also outlines the broader context, both in terms of the situation on the ground and similar historical anarchist experiences. If you’ve little knowledge of anarchism you should get a lot from the facts contained below, and perhaps the analysis that compares what we know with anarchist experiences of revolutionary transformation will whet your appetite. What is the economic structure now in Rojava? Well let us start by sayings it’s not the ‘full communism’ without bosses that anarchists would aim for but rather a mixed system that includes private businesses alongside the co-ops. As Erjan says in the video, today the situation is private business is not forbidden. People can do it if they wish, but it is not supported in the way the co-op system is supported. In anarchist terms is this not that different from the way things worked in a lot of anarchist controlled areas of revolutionary Spain. Small landowners were often allowed to continue to work their own land even if the rest of a village decided to collectivise. The large enterprises that were taken over were state owned and those of owners who had fled the revolution. Things went further in the areas where the anarchists were very strong (e.g. the Woodworking Industry in Barcelona that collectivised all workplaces) but that represented a high tide mark rather than what was typical everywhere. In Rojava the Assad regime kept the area under-developed, as an agricultural breadbasket for Syria, so there were not that many large businesses to start with except state owned utilities. Of the few other privately owned big businesses the owners seem to have mostly fled the region. There is a huge multinational cement factory but its location is near the front line and it’s been the scene of combat, so it appears not to be currently in production. The exception we heard was land ownership – although some large landlords fled many are still in place. Below we look at how this is probably related to the tribal-feudal structures that sit alongside capitalism in the region. The comparison we make above with Spain 1936-7 is important because the Spanish revolution of 1936 still represents a high point of workers self-management. And in that context it’s quite relevant that a section of ultra-left Marxists in the 1930s also refused solidarity with anarchist Spain because, as they correctly pointed out, capitalism had not yet been abolished and compromises had been made. Anarchists, in Spain and internationally, criticised the compromises but still remained in solidarity with the revolution, including fighting on the front lines. Another important aspect to keep in mind is that although anarchists now know a fair bit about the Spanish collectives this wasn’t true at the time they were functioning. Gaston Leval’s massive study didn’t appear in English until 1945 and even his briefer article on the collectives in Aragon was only published two years into the revolution. During the period from 1936 to early 1937 when the collectives were strong, only fragmentary information was available about them outside Spain, much of that hostile. Importantly, unlike Spain – where millions of workers were self described anarchists at the start of the revolution and so were prepared to take over their workplaces – in Rojava it would appear that only a small minority were ideological revolutionaries at the beginning. If we think of the scene in the Ken Loach film Land & Freedom, where the liberated village debates whether to collectivise the land, the importance of this becomes clear. The impulse for collectivisation in that scene mostly comes from within the village due to the already existing anarchist presence, it’s not imposed from without. In a Rojava equivalent we could expect that the impulse at least initially would be dependent on the arguments of the militia who had liberated the village rather than its inhabitants. By 2014 in Rojava we are told in the video that there were many co-ops but now (early 2016) there are three to four times more, probably thousands. Many of these appear to be small, we are shown photos of a textile co-op and a women’s bakery co-op. Given the blockade on Rojava we know it’s hard to import machinery and impossible to import large machinery so it’s a question of building co-ops with what is already to hand, these are going to be small and labour- rather than capital-intensive. Individually we are told that while these small co-ops are working well the challenge is networking them to work together. For this reason there is a new distribution co-op formed, that is a higher level one that brings together many co-ops. This has upwards of 10,000 members. What’s important, we are told, is that the co-ops are initiated and controlled by the communes, i.e. the community assembly structures. Co-ops are not individual or completely independent, they are very connected with the assembly process. – People’s Council of West Kurdistan (PCWK, but more normally referred to as Tev-Dem) which is the entire region but because of the war had been meeting as the 3 separate cantons rather than a single body. We are told that when the structures described were declared in January 2014 there were 1,500 communes, but now there are 4,000. That the communes bring people into the political process and empower people. The reason for the growth from 1500 to 4000 communes over this period is not explained, it seems unlikely the increase is simply more territory being held, since January 2014 was before the big ISIS assaults on Kobane canton that overran the entire countryside and was only pushed back after the months-long siege of Kobane. So it seems the increase in the number of communes, at least in part, is an outcome of the methodology spreading. Perhaps the outcome of lots of ‘Land & Freedom’ local discussions? 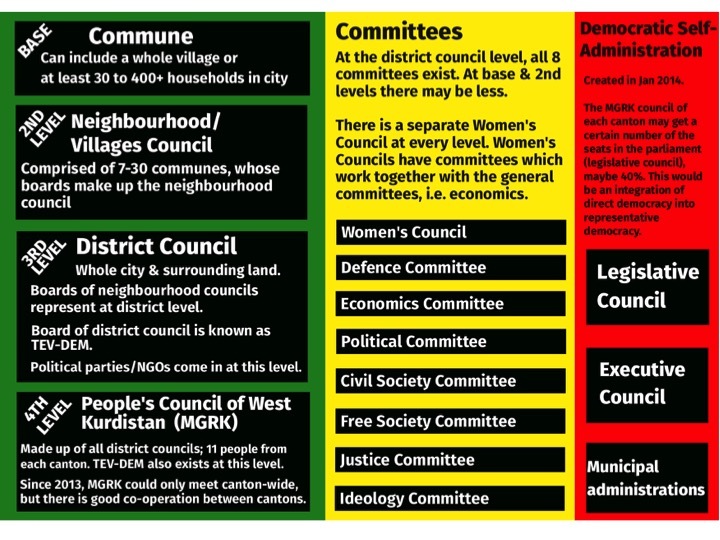 In the middle of the diagram there are the 7 standard committees that exist at each district level (Defence, Economics, Political, Civil Society, Free Society, Justice, Ideology) plus the Women’s Council. On the right of the diagram is ‘Democratic Self-Administration’ which is a more conventional government structure of legislative and executive bodies as well as municipal administration. We are told 40% of the seats in the parliament come from the PCWK / Tev-Dem, the rest from political parties, including other Kurdish parties. So the parliament is a blend of direct and representative democracy. We are also told that this system was established two years ago. The population of Rojava isn’t all Kurdish, so as well as the different Kurdish political parties there are also parties that are largely Arab, Assyrian and Yazedi. In the last months, as ISIS have been beaten back, the picture presented in this talk has become more complex as the new areas liberated are majority non-Kurdish. So we’ve seen the emergence of the ‘Syrian Democratic Forces’ as the umbrella organisation for all those fighting alongside the YPG and, as areas are liberated, the formation of local military councils overseeing that process. When ISIS are kicked out of Manjib and hopefully Raqqa what governance structures will come into being in those majority Arab towns and how will they interact with the rest of Rojava and Tev-Dem? There is no reason to assume any strong pre-existing ideological affinity with the Tev-Dem project or a commitment to the organisational methods being used. How is that contradiction handled? In anarchist terms this is where the greatest contradictions lie, in the conflict between the delegate based democracy of the communes and the mostly representative system of the ‘Democratic Self-Administration’. This contradiction has been a feature of many revolutions, sometimes called ‘dual power’, and the defeat of the revolution is tightly connected to conventional government structures using their control of the police & military to repress workplace & community assemblies. This is what happened in the Russian revolution, with the positive gains of the revolution being defeated as the Bolshevik party used government power to repress soviets and workplace assemblies. The anarchists faced the same problem in Spain in 1936: although a large minority of workers were anarchists not all were, leading some to fear an ‘anarchist dictatorship’ if the anarchists took power. Like Rojava this led to parallel systems of community and workplace assemblies, one seeking to federate upwards and the other a standard representative government issuing commands downwards. In Spain as in Russia this ended with the police & military being used to repress the assemblies, long before the republic was defeated by Franco. There was a lot of debate in the anarchist movement in Spain about what to do and the solution reached wasn’t great, it was individual ‘anarchist ministers’ taking posts in the republican government. A similar but even more complex problem exists in Rojava. The PYD is not the only political organisation in Rojava and not everyone agrees with its goals and methods. So what do you do with other political organisations that are more conventional? Suppress them or create this sort of unstable dual power structure? The magical solution would be to somehow go over/around the leadership of the other parties to organise their supporters in the communes already described, but, even if successful, that would be a process that takes time, not a moment that can be brought into existence. The PYD is in a far more difficult situation than the CNT was in Spain. Not only did the PYD organise a much smaller part of the population before the revolution, but Rojava is much more divided by ethnic and religious differences than Spain was. It’s worth noting that those most critical of the dual nature of these structures are often also those most suspicious of the ideology of the PYD (and PKK). Which leads them to the contradictory position of simultaneously demanding the suppression of other parties (the reality if all power goes to the communes) but also warning against the danger of the PYD suppressing other parties. Of course the PYD suppressing other parties but retaining the parliamentary structure would simply be the equivalent of how the Bolsheviks undermined the revolution in Russia. The best solution advocated in Spain was that put forward by the small minority who organised as the Friends of Durruti. They wanted a revolutionary council comprised of mandated recallable delegates from the anarchist and socialist trade unions to replace the function of the government. Almost all workers were members of one of the unions so it was seen as a structure that answered the need for coordination, particularly in the war effort, but only excluded business owners. But there isn’t a parallel solution for Rojava since, unlike Spain, most workers are not members of an anarchist or socialist union. Indeed it’s likely that a lot of work takes place outside the formal economy so even if such unions did exist they would probably only organise a minority. In any case there isn’t a clear equivalent demand to the one for a union based military council advanced by the Friends of Durruti as a workable alternative to conventional government. Anarchists could advance ‘all power to the communes’ but that inevitably suggests the de facto suppression of political parties and so only becomes workable when large majorities are won for such a position overall in each of the ethnic and tribal groups. We are told in the video that the basic structures described in the slide are the same in Bakur, and that Rojava had the advantage of being able to learn from the experiences in Bakur since 2007. ‘Bakur’ means North Kurdistan and is the preferred term for the area of Kurdistan under the rule of the Turkish state. ‘Kurdistan’ is the term used for the regions that have a majority Kurdish population but are currently part of Turkey, Syria, Iraq and Iran. There is no real surprise here as the influence of the Bakur based Kurdish freedom movement on the PYD is more than obvious, indeed hostile critics want to write off the PYD as no more than a PKK puppet. The PKK being the military, and to a large extent ideological, element of what’s often called the Kurdish Freedom movement in Bakur. From the obituaries of YPG/J volunteers killed defending Rojava, we already know that a fair number of people came from Bakur to help the revolution in Rojava. This we can assume would extend into areas other than armed defence and be part of the process of transferring knowledge and influence. This is why ultra left marxist criticism of Rojava is so heavily based on criticism of the PKK’s history in Bakur, and in particular of Ocalan, the jailed PKK ideological leader. The influence of the Kurdish freedom movement in Bakur, including the ideological and military influence of the PKK is tricky to have an open discussion of because the PKK are on the global terror watch list and brutally suppressed in Turkey. And the Turkish state has long refused to make any distinction between the PKK and any person of a movement that shares a similar ideological perspective. To frame it in an Irish context, it’s the equivalent of suppressing every republican activist by treating them as if there were members of the IRA. Even before the failed coup thousands of Kurdish political activists, including many elected mayors, had been jailed in Turkey. Alongside that state action there is also the danger of Turkish nationalist lynch mobs attacking individuals and organisations. At times of tension, including around elections, such attacks become very common. This means it’s literally impossible for core participants to have an open discussion about ideological and organisational influences in Turkey. Internationally there is even the odd situation where Facebook (and now, it appears, Twitter) has an automatic ban for even posting images of the jailed PKK leader Ocalan. For that reason conversations very often need to be coded in ways that somewhat reduce the possibilities of prosecution or social media bans. To return to the video, we are told that if the ideas implemented in Rojava initially came from Bakur, from 2014 because of the concrete experience gained they started to flow in the opposite direction. Although a decade old, the attempt to set up similar parallel power structures in Bakur have led to the jailings of thousands of activists over the last decade including many town mayors. That must have had an enormously disruptive effect on how grassroots organising experiments worked out. For instance making it very hard to know if a specific failure was due to some inherent internal problem or the fact that key organisers had been jailed. Rojava is under economic blockade and military assault, and, even far behind the front lines, the constant danger of ISIS suicide attacks. But in the areas and times where there is relative peace the experiments in assembly democracy and co-ops have much more freedom from interference. The video then switches to Janet Biehl, an eyewitness who has a very high ideological affinity with the theoretical process but who, not being Kurdish, doesn’t have such affinity on the basis of a shared nationalism. She talks about witnessing assemblies in progress in the largest city and how they involved women and non-Kurds. She describes the same structure of street level communes sending delegates to a neighbourhood council, which sends delegates to the district council (of the city and surroundings) and then the district sends delegates to the council for the canton. She very clearly specifies that the delegates are mandated and recallable, in other words that this is a system of decision making entirely compatible with anarchism. She confirms the figure of 4,000 communes and talks about the Rojava social contract that guarantees human rights including gender equality. This is used as a reference point to resolve disagreements, something akin to a constitution in a non-state setting. In the video extract we’ve also included one of the questions from the floor and summaries of the response to it below. This clarifies some of the discussion of co-ops that we’ve had above. Question – To what extent is it a competitive market economy, how do the assemblies relate to the organisation of the economy? Janet – co-ops are accountable to the assembly system. Erjan – Every commune has an economic committee and they initiate the co-ops. A few communes often come together to talk about what is produced in the area and how a co-op can be formed around this. After the revolution land that belonged to the state was taken and given to the poorest people who then mostly organised in co-operatives. Then farmers were encouraged to come together and from co-operatives. The big co-operatives that handle distribution have an effect on limiting prices as otherwise the supply of goods is dependent on smugglers and because of the war their prices are high. The large state companies that were taken over initially as public companies and now being transformed into co-operatives, slowly and carefully. There are some areas where private companies are still dominant, changing this needs a process of making the co-operatives bigger. There isn’t really class conflict in terms of companies as there are not really higher bosses [they have fled? because there were no big companies outside the state sector?] but there are some big land owners still in the area. The TEV-DEM policy is not to seek direct confrontations with land owners as this would create other social problems, and in any case is not needed as there is a surplus of agricultural land, even over-production of some goods. So there is a process of diversifying agriculture which means it’s possible to feed the population better and have food sovereignty. It’s likely the ‘other social problems’ referred to in relation to large landlords who have remained are a product both of tribal feudalism on the one hand and ethnic diversity and division on the other. Under tribal feudalism the heads of these tribes are often large land owners, think of them as very large extended families, who can therefore potentially use tribal loyalties to generate a defence, including armed defence of those holdings. For a long explanation of these structures and their importance in shaping the reality of radical politics in the region see: https://youtu.be/y4NMASjaGRQ. In this context, what might be intended to be a restructuring on class lines (i.e. a conflict between those working the land and the landlord/owner) carries the very real danger of instead creating a cross class resistance along the lines of tribal loyalty if it’s imposed from outside. And of course the fact that for now in Rojava the initial ideological influence is overwhelmingly Kurdish makes this a much larger problem if the landowner and his tribe are Arab. What starts as a conflict over land on that basis can very quickly turn into something that looks like ethnic cleansing. Indeed the accusation that the YPG is engaged in ethnic cleansing surfaces from time to time, presumably in part because newly liberated regions will include tribal groups where the patriarch for one reason or another had aligned with ISIS. Add to this that this is not a region that has seen long term stability between the different ethnic groups and the tribes that compose them. Rather, particularly in the aftermath of world war one, it’s defined by vicious programs, expulsions and genocides, where both western powers and domestic rulers exploited existing divisions to arm one group against another as part of the break-up of the former Ottoman empire. And this was a process that extended into the 1970s and beyond, the regime had a policy of removing some Kurdish villages and moving Arabs into them in order to create an ‘Arab belt’ in particular along the border. The current civil war has been marked by sectarian massacres, the most infamous being the attempt by ISIS to genocide the Yazidis out of existence. This is a context in which any suggestion of ethnic conflict has to be avoided. This underlines that the Rojava revolution is important not simply because it is an experiment that approaches direct democracy and economic egalitarianism but also because the alternative is horrific. At a moment when ISIS, Trump & PEGIDA strive to set ethnic and religious groups at each other’s throats under their common ‘clash of civilisations’ ideology, Rojava offers a very different set of answers. Ones that we should pay close attention to. This entry was posted in Commentary and tagged Alternative Economies, anarchism, cooperatives, revolution, Rojava. Bookmark the permalink.